Arthur Gustave Otto passed away at the Maple Crest Living Center in Madison, Maine on November 29, 2018. Arthur was born in Brockton, Massachusetts on March 16, 1940, son of Gustave Otto and Elsie Sheinker. 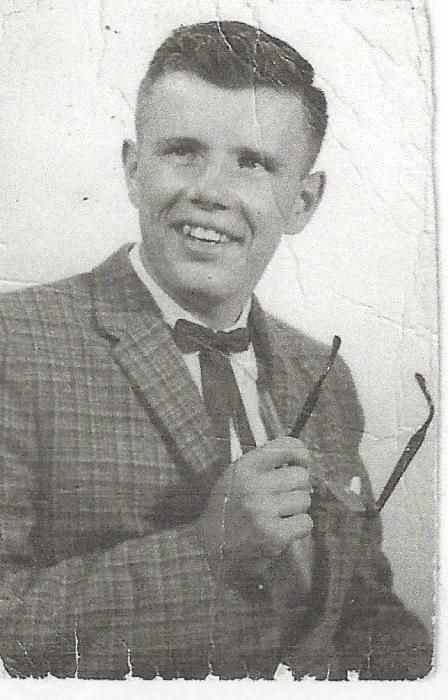 Arthur graduated from Stoughton High School in 1958 and Boston University in 1963. Arthur was born with a formidable handicap: he was legally blind. Despite this challenge, he completed a college education, married Mary Lareau, blind friend, and launched two businesses,a commercial cleaning service and a gardening/landscaping service in the Brockton area. He worked long hours in these physically demanding professions to support his family, which expanded to include two daughters,Ellen May (b. 1966) and Dorothy Ann (b. 1969). Medical problems eventually forced him to close these businesses. He was divorced in 1982, although Arthur and Mary remained friends for the rest of their lives. In 1985 Arthur moved to Caffery Towers in Brockton. Arthur loved “Oldie” music, hosting the “Happy Otto” music and talk show on the Massasoit Community College radio station for eight years. He also organized musical programs for residents of Caffery Towers and did volunteer work for the National Federation for the Blind, serving as a chapter president for several years. Arthur had a heart of gold, sharing his meager possessions with needy residents of Caffery Towers. He also had a deep faith and extensive knowledge of the Bible. becoming an “armchair evangelist” who eagerly shared his faith with others. In 2010 Arthur moved to Madison, Maine to live with Ellen May and her family., then to Hilltop Manor in Dover-Foxcroft, ME in 2013. In failing health he recently moved to the Maple Crest Center. Arthur is survived by his daughter Ellen and husband David Hale in Madison, daughter Dorothy and husband Jeff Rogers in W. Paris, Maine, five grandchildren and seven great grandchildren, most of whom live in Madison, and his brother David, who lives with his wife Apolonia in Carrboro, NC. Arthur will be remembered with fondness and admiration by family and friends for his impressive accomplishments in overcoming blindness. A memorial service will be held at the New Horizons Community Church in Skowhegan, ME on December 15, 2018 at 11:00 AM. He will be buried with his parents in Canton, MA at Knollwood Memorial Park. Arrangements are under the care and direction of Giberson Funeral Home, Madison.